Self-recognition – loosely defined as the ability to look in the mirror and recognize the reflection as you – is what separates humans from most animals. A critical survival strategy and an essential element of maturity and self-development, self-recognition protects us from the foreign and assists us in integrating the domestic. It is through self-recognition that we shape our worlds. 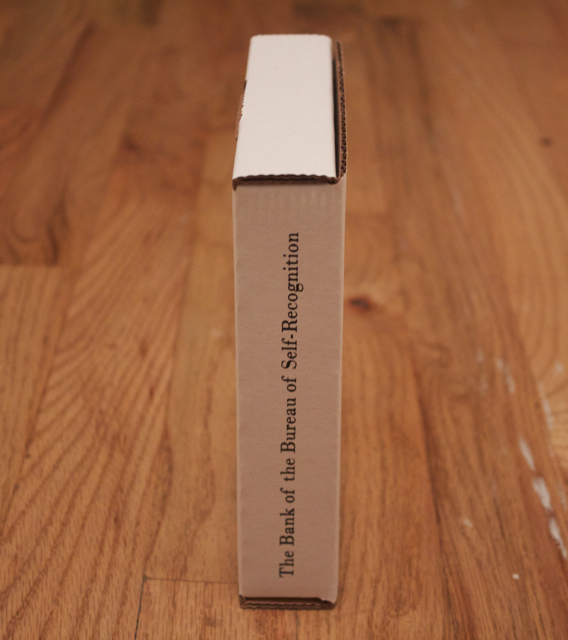 The Bureau of Self-Recognition is a conceptual performance and installation project designed to track the process of self-recognition and its myriad outcomes. Through individual exercises, spatial investigations, video and audio recording, lectures, and experiential performance, the Bureau brings together the clinical and the personal in a unique institutional environment. The project, which began in October 2011 with the photographic research series Practice of the Daily, has five phases: Recognition of the Daily, Introduction of the Other, Public Presentations & Workshops, Full Scale Exhibit, and Web Installation. 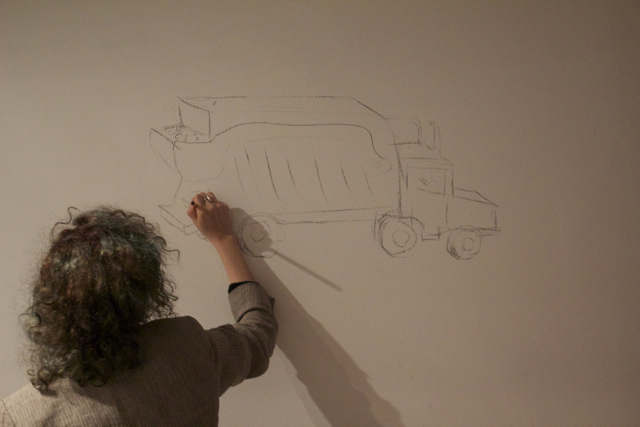 The exhibit took place at Momenta Art from May 31st – June 30th, 2013. Manifestations of the Bureau of Self-Recognition included the Bank of Self-Recognition, a Free Consultation program, and a tea room, among other things. A complete monograph of the project was published by am i human Press in conjunction with the artist. The Bureau has its own website here. The Free Consultation program was designed to extend the private research work of Practice of the Daily and Everyday Interiors to outside participants. 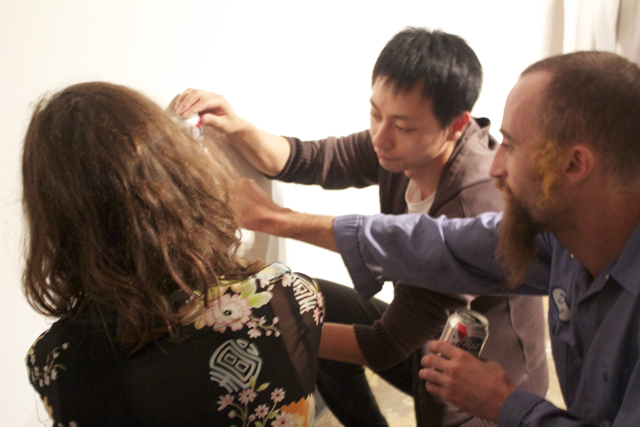 The customized sessions were designed to facilitate casual investigations into modes and definitions of self-recognition. Through 50 minute in person or Skype meetings, or targeted email communication, each consultation client was given a standardized exercise one (a basic mirror exercise), and then a personalized exercise two, which was based on prior communications and interests. Each client was allowed to select his or her desired medium for output. Free Consultations are one-on-one performances between each participant and the Bureau of Self-Recognition. The series is an attempt to access the challenges and boundaries of intimate, ongoing performance that exists both live, and via electronic correspondence. Free Consultations also tests the impact of regular practice, emphasizing consistency rather than quality, on a person’s perceptions of everyday life. 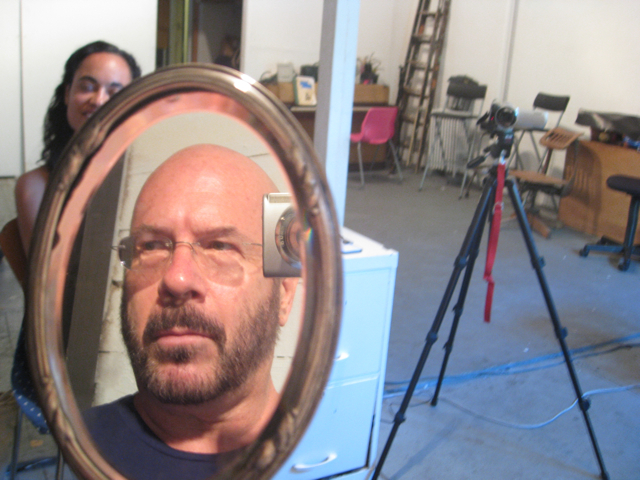 The exercises started off as measuring internal relationship (between self and mirror image), then explored the relationship between the self and the external world, and then between the self and other people. The program was in process from 2011 – 2013. Moore than 25 clients were served, some of whom are still engaging with their assigned exercises. 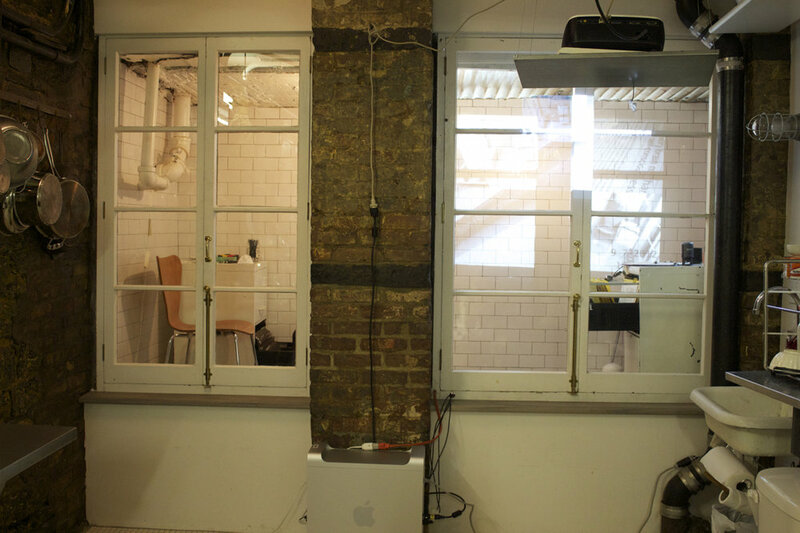 Work from Free Consultations is featured as part of the Field Notes series on Exit Strata. The Bank of Self-Recognition addresses issues of personal sustainability and assessment of value. The bank deals exclusively in the self-dollar, a currency created for the purpose of the project. Each self-dollar is equivalent to an hour for the holder to spend on him or herself. The dollar features the holder’s face (rather than the face of a historical political figure), and must be signed by the holder as well as stamped by the Bureau of Self-Recognition as signification of an ongoing contract. The Bank of Self-Recognition has been operating since March 2012. The project was developed for the Culture Project’s Women Center Stage Festival, and also appeared at Queens Media Arts Development’s ITINERANT Performance Festival in May 2012. The project will continue online for an unspecified period of time. 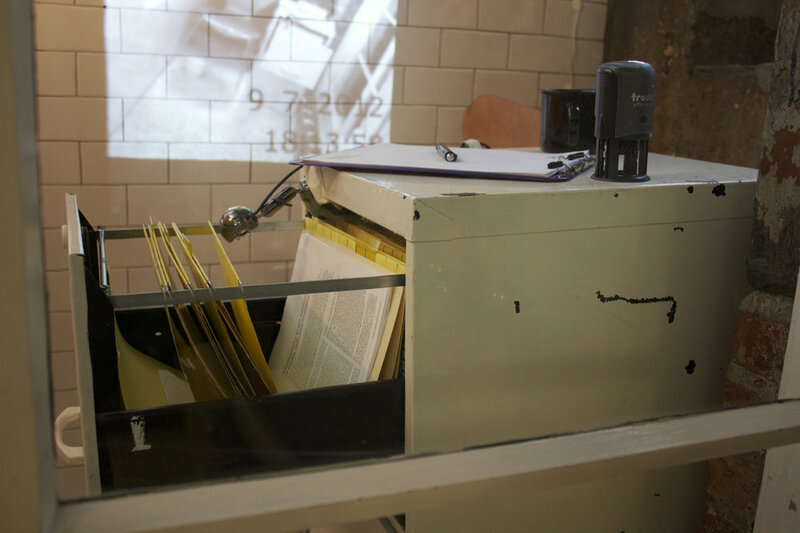 Inspired by Bruce Nauman’s Mapping the Studio I (Fat Chance John Cage) and the contemporary atmosphere of constant, tacitly acknowledged surveillance, Bank Vault captures the ephemeral goings on of a performance space when the performance is not present. The installation contains materials from previous performances of the Bank of the Bureau of Self-Recognition, including a 30 second promotional video with voiceover by the artist. 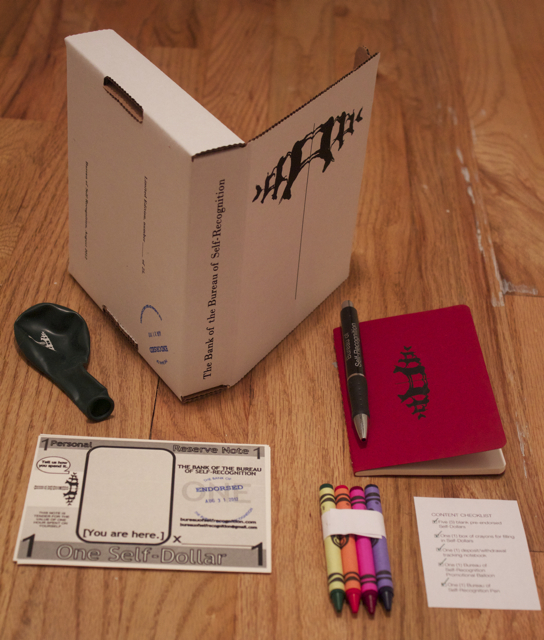 A hand screenprinted box containing all of the elements necessary to maintain a bank account with the Bureau of Self-Recognition. 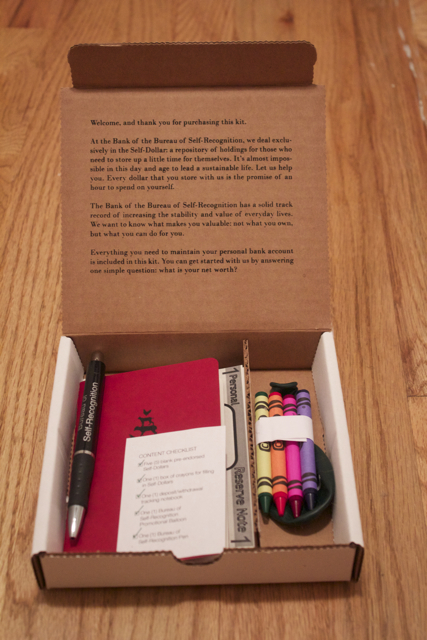 Contains a customized 3.5” x 5.5” Bureau of Self-Recognition Moleskine notebook for tracking deposits and withdrawals, 5 laser printed self-dollars (pre-endorsed by the Bureau), drawing materials, and a complementary Bureau of Self-Recognition pen and promotional balloon. Box dimensions: 6” x 6” x 1.25”. 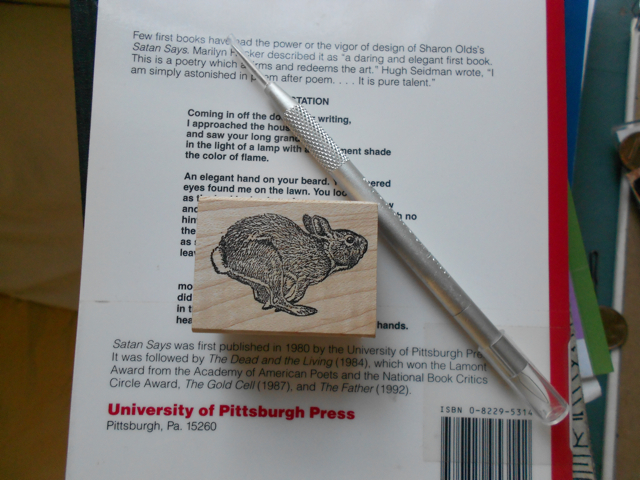 Edition of 25, each a signed and numbered original (also stamped and dated by the Bureau). Cost: $50. Produced with the assistance of Jessica Kaire and Ray Cross. To purchase, please contact the artist. Social Practice is an extension of the Bureau of Self-Recognition’s Free Consultation program. It’s a more generalized, exercise-based approach that aims to engage a larger number at one time, and to experiment with shorter time frameworks (5 minutes to 1 hour, rather than 30 days). Social Practice I was presented at Dino Eli Gallery (part of Diverse NY Performance Festival, curated by Non Grata), and involved pairing participants and asking them to engage with each other in the manner of parents attempting to develop speech patterns in infants. Social Practice II was presented at Performance Anxiety (curated by Ventiko) at culturefix: participants were asked to physically mirror each other while tied together with a fragile ribbon, testing the strengths and limitations of their pair bond. I served as the facilitator for both I and II. The Social Practice series was not documented. 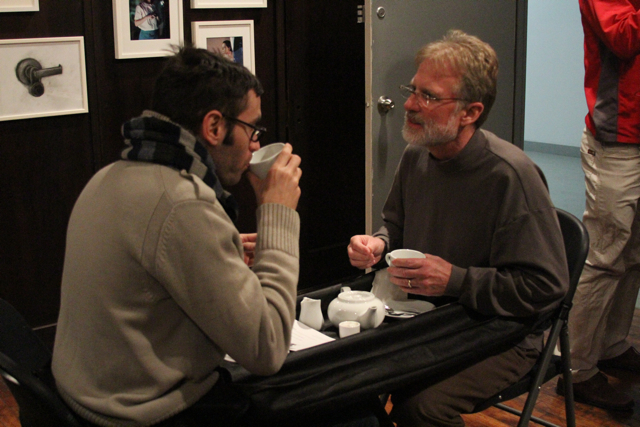 Tea Will Be Served was a mediated tea and conversation about how what we do shapes us into who we are. The performance premiered at Agape Enterprise in December 2011. Guests were coordinated into pairs and asked to answer a series of questions focusing on the structure of daily behaviors. 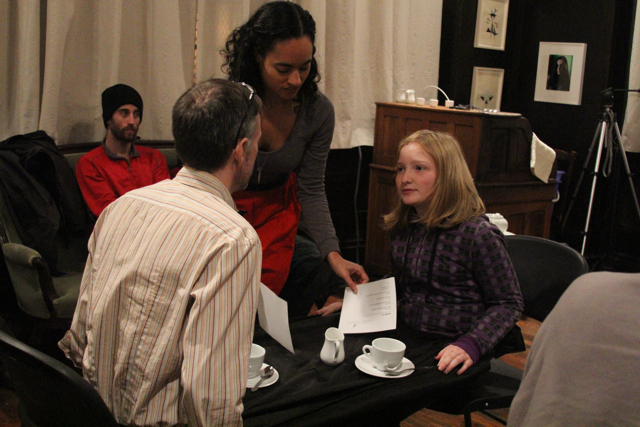 A set of serving exercises required guest participation, flipping the service expectation on its head. Rather than simply sitting and receiving a cup of tea, tables were wearable (and thus portable), and guests were guided as they moved around the space to collect the tea things. 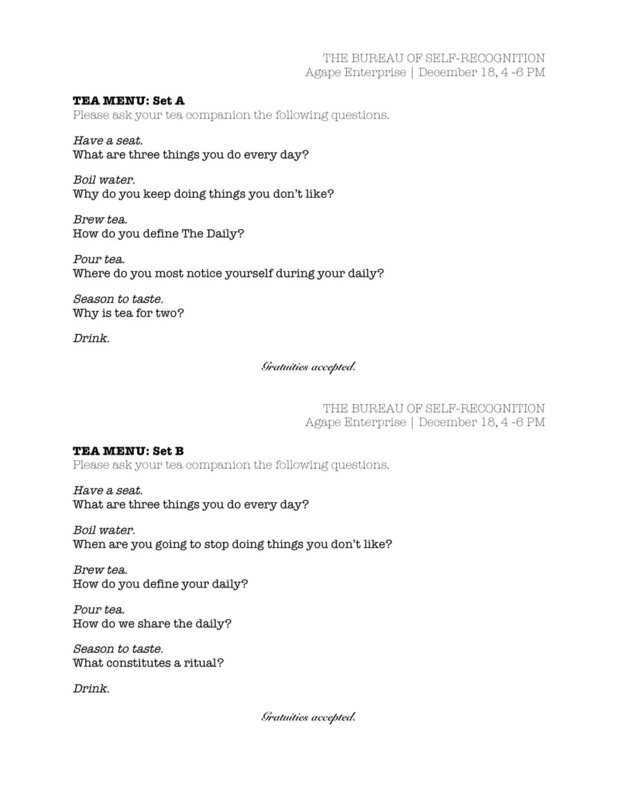 Interspersed with these activities, tea “menu” questions were asked in dialog. Each partner received a slightly different menu. Tea Will Be Served primarily addressed the relationship between expectations and reality. 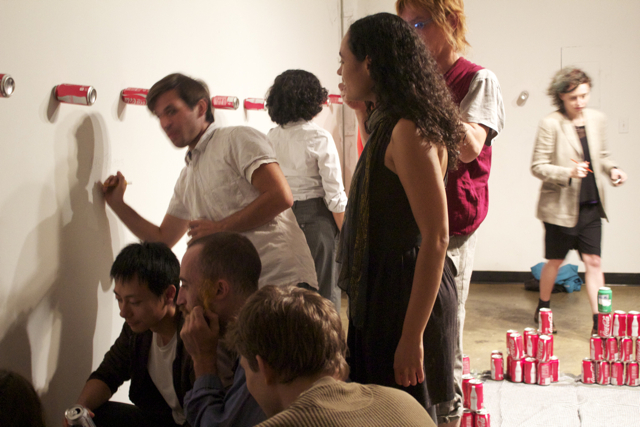 Through a series of relatively normal behaviors turned on their heads, the performance explored how making strange can illuminate both the moment itself and our understanding of the everyday. The performance also aimed to make guests, rather than the artist, the central featured performers, generating the “watched” content for themselves as they experienced it. The artist served only as mediator and guide. 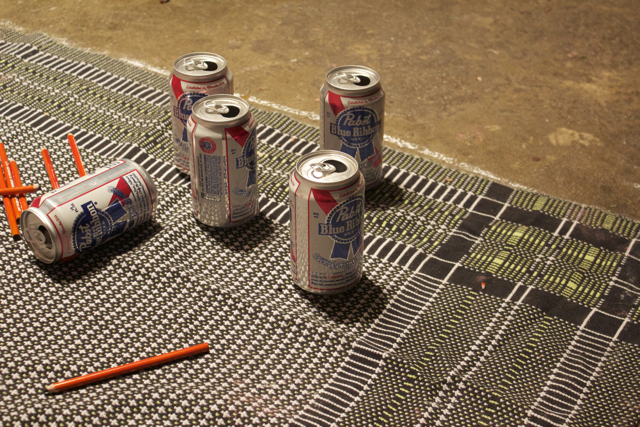 The wearable tea table was designed in collaboration with Mitch McEwen. “What would you do with . . .” (A Conversation About Value) was developed for the iCan exhibit at IV Soldiers Gallery, curated by Ivy Castellanos and Esther Neff. 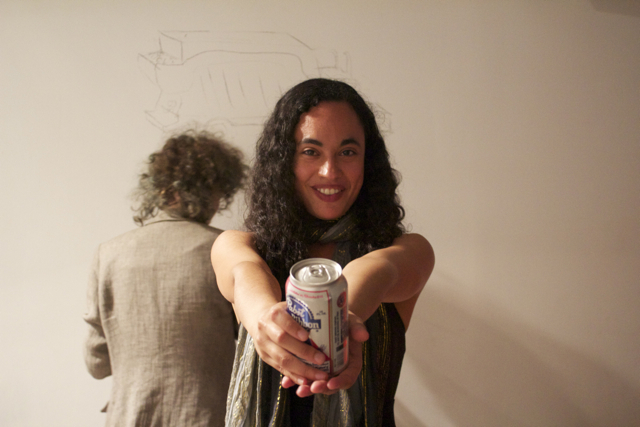 Read a conversation about iCan with Chloë Bass here.